To save you a bit of time, Penistone's very own Explorer John has discovered lots of things to do and places to go - and he's sure you'll find something here to occupy young minds (and hands!). He's even produced some activity sheets about places to explore like the Dragon's Den in Wharncliffe and things to spot on nature trails - and he might even convince you that learning about weather can be fun. Each of the sections below contains suggestions for places to visit and things to do along with some of the activity sheets. We hope you'll find something you like. Of course, you'll find even more things to do in the main see and do section but this makes a good start!. 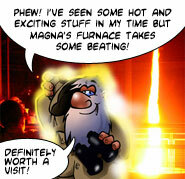 Two of the best places to visit to explore science are Magna and Eureka! They are both places where you can try all sort of exciting things like watching the big melt and riding the skeleton bike. At the National Coal Mining Museum, you can go 140 metres underground, see one of Britain's oldest working mines - and then see the pit ponies afterwards. Explorer John says "It’s really cool to drive the digger at Magna and I loved wobbling the loose tooth in the giant mouth at Eureka!" There's lots of hands-on stuff for kids to do, and of course there's a cafe for mums and dads to have a rest afterwards. Each of these great places has its own website so be sure to explore there first to get a better idea of what's on, when it's open and how much it costs. Some websites even have games and puzzles, too! Did you know that meteorology is the study of weather? Explorer John knows that if he looks at the clouds, it can help tell him what the weather might be like. If he wants to go out for a bike ride or play with his friends in the park, he wants to know if it‛s going to be a nice day or not. 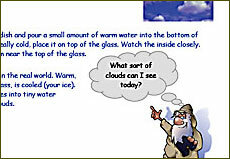 Read more about clouds, weather and even how to draw and make your own clouds in the exciting activity sheet! To save a printable PDF version of the Meteorology Sheet to your computer, RIGHT-click the link and choose "Save Target As" from the menu. 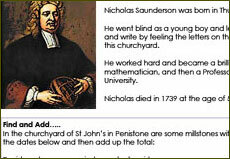 To save a printable PDF version of the Nicholas Saunderson Sheet to your computer, RIGHT-click the link and choose "Save Target As" from the menu. 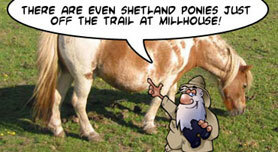 You can explore the countryside around the area, and see lots of wild flowers along the Trans Pennine Trail and even some Shetland Ponies. A bird book will help you identify the birds you see. The farms are a great place to get up close to animals and even touch them - and Cannon Hall Farm is a great place to go if you want to see animals really close up. You might even see an alpaca, llama or wallaby there! And there's even an adventure playground, too! Explorer John says ‘Some of the animals are really cuddly but don’t forget to wash your hands afterwards.’ And very importantly, please remember to abide by the Countryside Code, too. Of course we mustn't forget that the Penistone Show in September is a great place to see animals and various events, too. There's plenty of wildlife to see on the Trans Pennine Trail. Why not see which animals you can spot? Can you name them all? And which are you unlikely to see whilst you're there?! To save a printable PDF version of the Trans Pennine Trail Activity Sheet to your computer, RIGHT-CLICK here and select "Save Target As" from the menu. There are plenty of different types of birds to see on the trail, so make sure you take some binoculars with you! How many different types can you find? Do you see different ones at different times of the year? To save a printable PDF version of the Birds Activity Sheet to your computer, RIGHT-CLICK the link and select "Save Target As" from the menu. There's a variety of wildlife in the Penistone area. See what you can find on our sheet and then see how many more you can add. Take a pencil! To save a printable PDF version of the Naturespotting Activity Sheet to your computer, RIGHT-CLICK the link and select "Save Target As" from the menu. Interested in the weather? Then why not look at Explorer John's meteorology activity sheet in the Explore Science section above? You can even make your own clouds! History is much more than just a load of dates. You can see mills working and buy some of the flour afterwards or explore the amazing variety of things at Cawthorne Museum. They’ve even got bits from Pompeii which are nearly 2000 years old! Explorer John says ‘The jousting at the Royal Armouries in Leeds was really exciting. The mighty Dragon of Wharncliffe! Read more about it here along with some bad jokes! the link and select "Save Target As" from the menu. There's a sports centre in Penistone and directly opposite is a small private pool which is great for younger children. There's a larger sports centre in Barnsley, The Metrodome, with a swimming pool and also one in Stocksbridge, also with a swimming pool. Of course, there's also professional football, cricket and rugby to watch in the region. You can see more in the sports section of this site. The National Media Museum in Bradford has an IMAX screen which has a variety of films suitable for all the family. There are also exhibitions and permanent interactive displays - well worth a visit for the budding Spielberg. A fun-filled family day out! The popular Penistone Show is held on the 2nd Saturday of September every year and always has varied displays and progrmamme of events. Be sure to visit the Penistone Show website to see what's on. The popular annual festival also has a wide variety of entertainment and activities for children. From Archery to Zorbing - an alphabet of activities for kids and families at Shepley Spring Festival in May. You can read more on the Children's Festival section of their website. For information about promoting your business on this site please go to the advertising section. All proceeds go towards the upkeep of the site.